Accompanied by some old friends and a crafty new friend, Annabel faces one of the hardest challenges of her life: Trenthams, a prestigious finishing school. She’s about to face her toughest audience: a whole passel of teenaged girls. As if that’s not bad enough, Melchior has gone all cryptic – more enigmatic than his normal cryptic. He’s masquerading as a teacher at the school, not to mention he’d really like Annabel to quit treating him like her cat. Even if he used to be her cat. Luckily, Annabel’s new friend, Isabella, is experienced with hidden passages, smuggling, and setting up the important classes that the Trenthams staff somehow overlooked, such as Explosives and Lock Picking. There are mysteries afoot, magical mayhem, and a powerful royal staff disguised as a pencil. The royal pencil, ahem, staff, comes in handy, as Annabel never knows when she might need to sketch herself – and her friends – out of a dicey situation. That’s good, because everything is not as it seems; there’s a revolution brewing and Annabel hasn’t even been crowned. There’s a lot of deception and deceit going about, and as Annabel learns, most of it is accomplished by lying, otherwise known as carefully speaking the absolute truth, or a touch of skillful misdirection. There’s a lot of fun dialogue, banter, and camaraderie in Staff and Crown. The world-building is fresh and the characters are likeable. Although this is third in a series, the author includes enough information that readers won’t get lost if they are reading this as a standalone novel. W.R. Gingell’s writing gets better with every book. 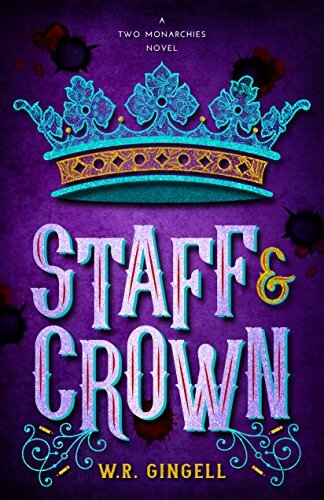 Staff and Crown is a really fun, engrossing read. Highly recommended. Three years have passed since Annabel defeated Mordion in the Royal Castle and became the Queen Heir of New Civet. That’s a good thing, since the Castle spat her out three years into the past. Three years of statecraft, politics, and meeting important people are over. Now, before she is officially acknowledged as the Queen Heir, Annabel will face her biggest challenge: Trenthams Finishing School for Young Ladies. To win her Staff and Crown, Annabel had to deal with a deadly foe, a slightly self-aware castle, and a more-than-slightly-potty wizard. Now she will contend with corsets, diets, and sharp-tongued socialites; not to mention the Old Parrasian revolution that seems to be brewing in the bowels of the school itself.